This path has led me to a place where two worlds find a home. That to fall into the wild ways is where I truly find my rest. When Chris and I first began to explore the possibility of travelling by sea and not land, as we had originally intended, I was asked a question. How would I cope with endless miles of green ocean instead of the green of forest and woods? It was a question that made me reflect quite a lot and for a while concerned me. I know I am in my element spending time outside in woodlands and I take great pleasure in seeing the seasons change within them: the monotones of winter and the possibility of snow; the limes greens of spring and the beauty of a woodland carpeted with bluebells; the heat of summer, balanced by cool evenings and finally the riotous shades of autumn and the twirling dance of falling leaves. As I pondered, it did feel as if I was losing something and wondered for a while if it was going to be a problem. Yet, I needn’t have worried, Denmark showed me that for the moment these two worlds of woods and sea can be sit happily together for a while and I can be in my element in both. One hot afternoon, after working on our boat, we headed to the far eastern edge of Als, one of many islands that make up the Kingdom of Denmark. 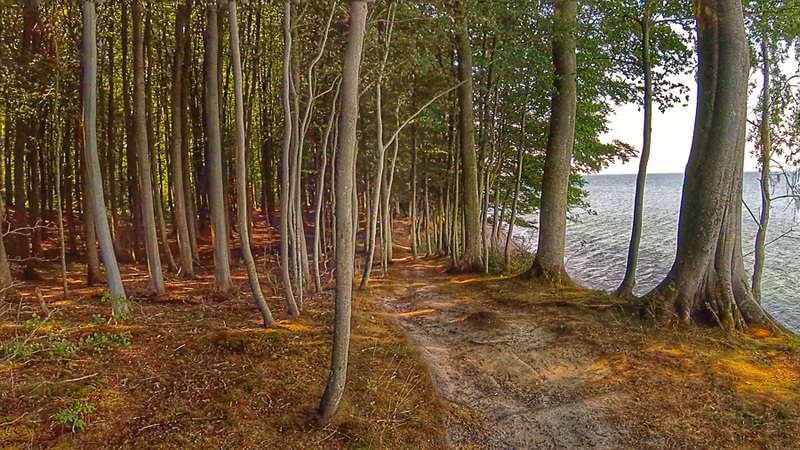 We had read about an ancient beach woodland that ran for 7km along the coast, Nøreskoven. We parked the car and followed the woodland tracks, quickly finding ourselves at a delightfully unspoilt stone beach. The track hugged the coast weaving its way through the beach trees. A various intervals were fire pits, stacks of logs and picnic tables ready for use. I decided there and then this was heaven and that being experiencing the best of both worlds was no bad thing! The wind and sky are the remaining of the four elements of world as I see…clouds moving as if land in ice above and breeze my invisible friend rustling the leaves with force..together the wilderness seems so beautiful at night…stars are a delight..